THE COMBINED INFLUENCES OF THE ANDES, THE HUMBOLDT AND THE PANAMA CURRENTS CREATE 7 DISTINCT CLIMATE ZONES IN ECUADOR. 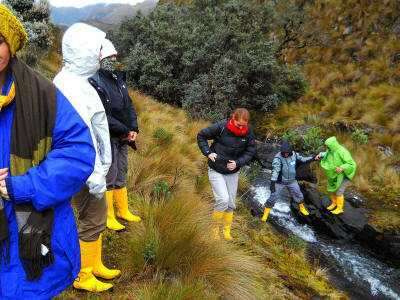 With so many different climates in Ecuador, there always is a best time to visit Ecuador. 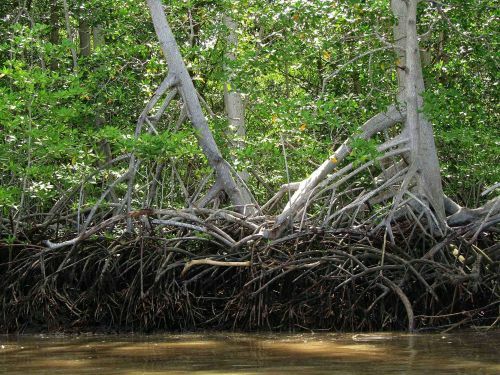 Additionally, the coast of Ecuador is a transition zone from the wettest tropical region in the world - the Chocó in Colombia - and the coastal desert that starts in Peru and progresses to the word's driest desert in Chile. 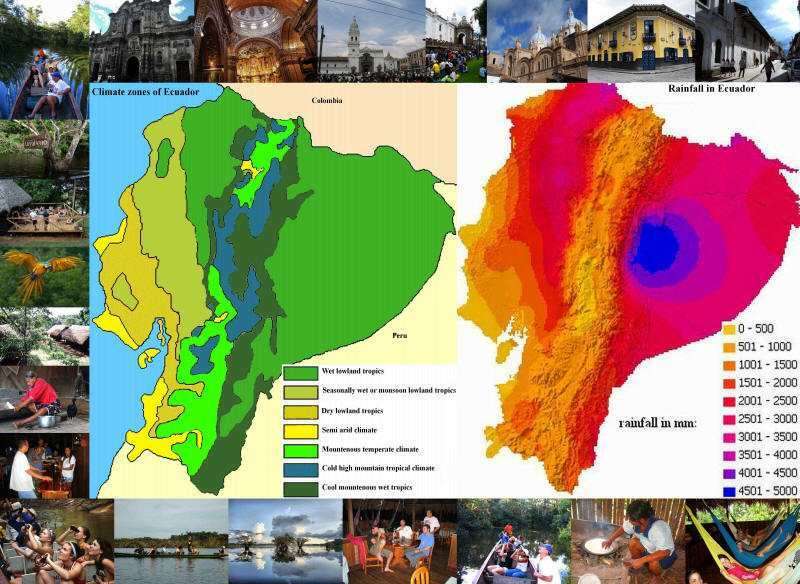 This results in a tropical wet climate at the border with Colombia, a seasonally wet savannah climate at just North of Guayaquil and a semi arid climate near the border with Peru. The map at the bottom of this page shows 9 major climate zones, but at a micro detail, there are more climate zones, such as the permanent polar conditions on the snow-capped mountains, high elevation semi-deserts in some valleys in the Andes, etc. The climate conditions in the different macro regions may be totally independent from each other, as the pictures beneath clearly show. 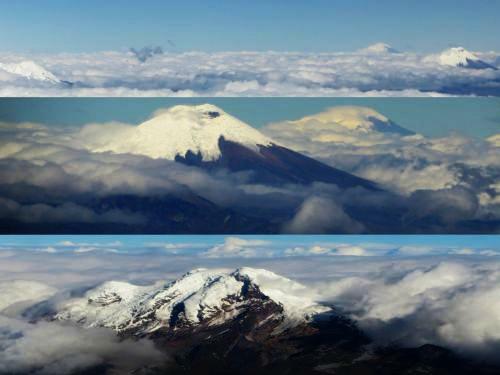 On the left one can see the snow-capped mountains of Altar, Cayambe, Cotapaxi and Chimborazo above the clouds on the same day from the airplane during the dry season in the Andes, that ranges from July - September. Only in the dry season can one see so many volcanoes on the same day. 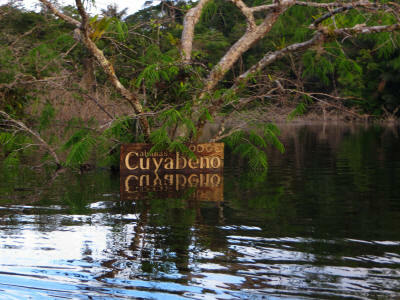 At the right, a picture take the previous day of the sign of the Cuyabeno lodge half covered by water, due to the highest elevation of Cuyabeno Lake during the wet season that we have ever observed in the 25 years of its existence. 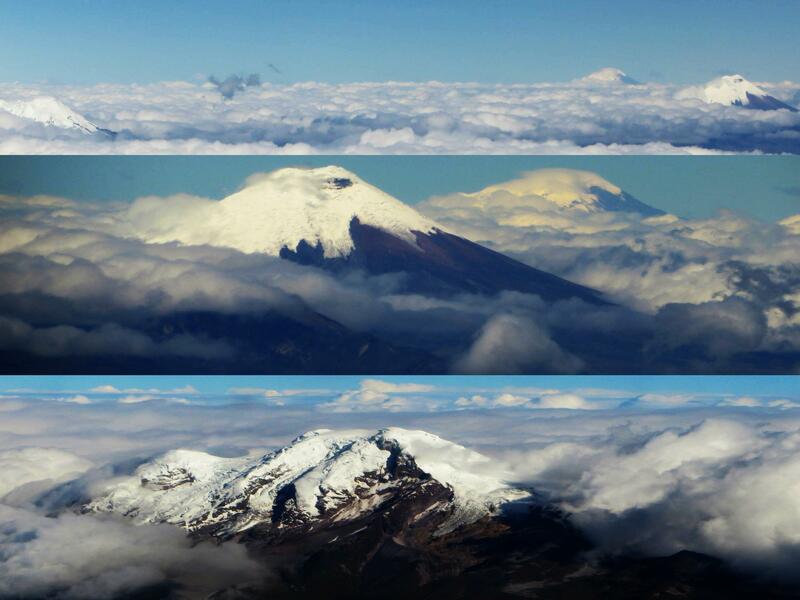 Antisana, Cotopaxi, Chimborazo and Cayambe in the sun, above the clouds on the same day. This only happens occasionally during the dry season in the Andes. 2014-07-23. 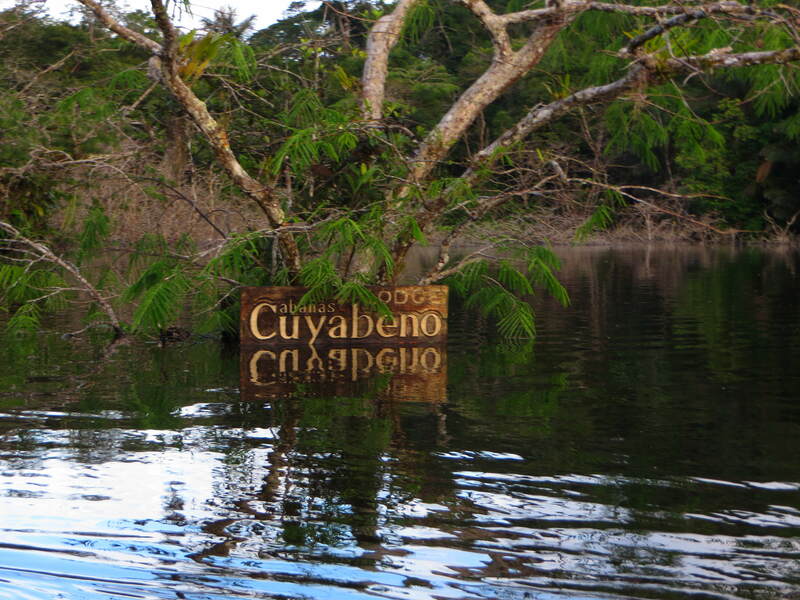 Amazon wet season: highest level of Lake Cuyabeno as far as we can remember on 2014-07-22. Climate in the Amazon of Ecuador. As the weather and climate in Ecuador vary greatly with elevation and region, you need different clothing for different regions. Depending on where you travel, you have to be prepared for hot weather in the western lowlands and Galapagos National Park, with thin shirts, shorts and light trousers. For the central Andes valley, the Andes flanks and Cuyabeno, be sure to take a light sweater or buy one locally, because the evenings may turn chilly. If you plan to go up in the highlands above 3500 m, be sure you bring adequately warm clothing, because - depending on elevation - temperatures may turn wintery cold. Be prepared for rainfall everywhere, so bring a nylon poncho and/or water-coated light rain jacket. WARNING: You will be on the Equator. UV radiation is extremely high everywhere you go and you need to protect you adequately, even if you are dark-skinned. Always where a hat, not just a baseball cap, and please, don't wear sandals or bear feet when you come from abroad. I have seen such horribly painful feet on people who covered everything but their feet. Your feet get the most direct sunlight as they are exposed horizontally to the sun! Always put on high grade sun block (don't forget the edges of your ears). Accustom your skin to the sunlight by exposing it for no more than an hour the first day and add an hour everyday afterwards. Don't be fooled by an overcast sky, you can still get sun burn. Be particularly aware in the highlands, where the UV is even higher! ; and on the water (Cuyabeno, Galapagos), because on the water, the UV effect is greater. Also beware of wind, as it also tends to increase the sun burning of your skin. In the Andean highlands the climate is spring-like with pleasant weather with temperatures that may run up to about 25 degrees Celsius, while cooling off to about 15 degrees at night in Otavalo, Cuenca and Quito, which vary in elevation from 2300 - 2900 m. Often the mornings are sunny, while in the afternoon the sky becomes covered with clouds and rainfall may force you to take shelter in one of the many great in the colonial centers of these great cities. In the Central Andes valley, predominate spring-like weather conditions resulting from the higher elevation and a rain shadow form the much higher surrounding mountains. In some valleys, with extreme rain shadow effect, the predominant weather conditions may be dry to semi-arid, though with moderate temperatures due to the high elevation. 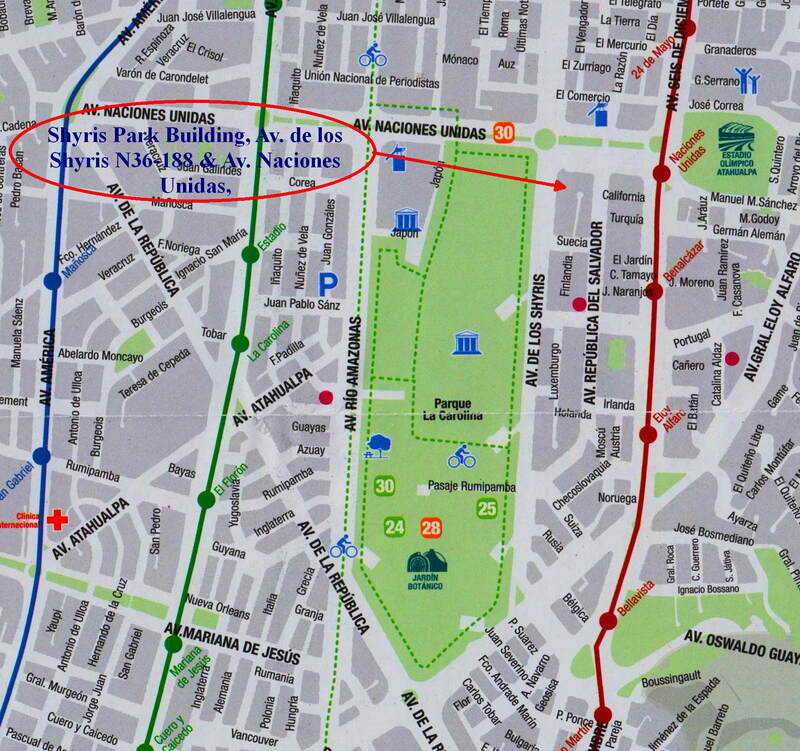 The area of the "Mitad del Mundo" is a good example. The most moist weather conditions predominate on the external Andes flanks where the tropical winds are forced up; as they rise, rain is forced from the clouds to extremely high annual rainfalls of up to 5 m in the area of Pastaza. In those areas, the temperatures are much lower due to the higher elevation and weather conditions are very rainy indeed. In the extreme elevations, above 3500 m, the climate becomes cold and several mountains in Ecuador are permanently snow-capped. Best climate map, best time to visit per zone, detailed weather graphs. The climate of the Amazon rainforest in Ecuador is characterized by an average of about 3000 mm of rainfall per year and an average temperature of 23° C. However, temperatures are lower in the foothills of the Andes. What is important however, is the fact that the Ecuadorian Amazon is located right on the Equator and runs right through the Cuyabeno Faunistic Reserve. As a result its "dry seasons" have lower rainfall than the rest of the year, but even then, rain showers occur and it never becomes totally dry. 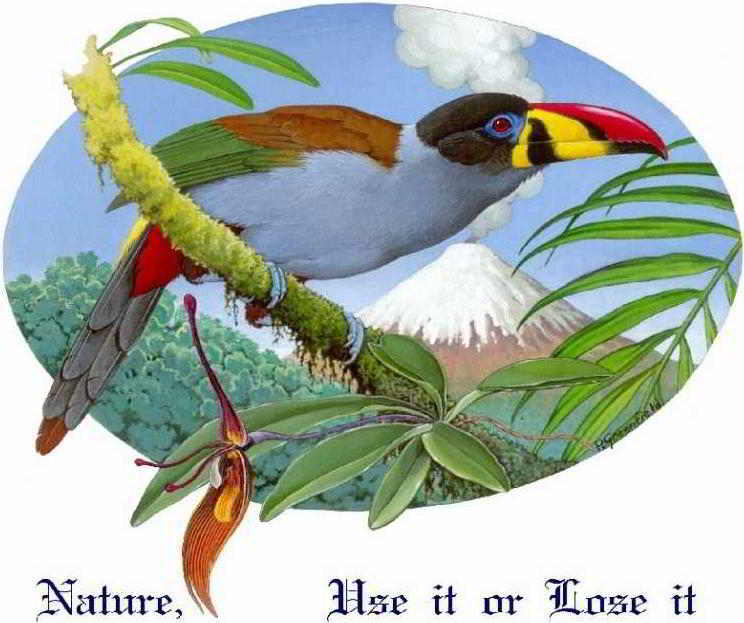 Therefore, more moist-dependent tropical species of plants and animals can live in the Amazon of Ecuador than anywhere else, with the Cuyabeno Wildlife Reserve having the greatest recorded biodiversity in the world. 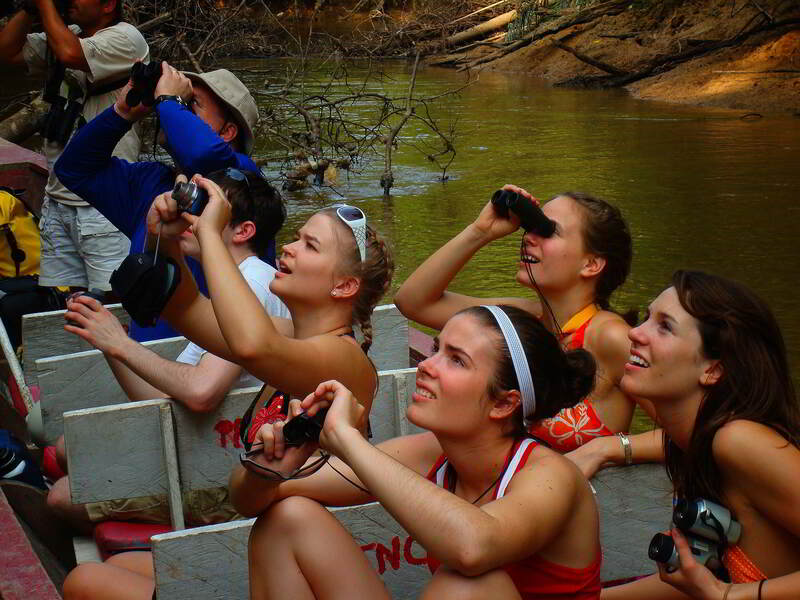 The guides of our Ecuador Amazon rainforest lodge, the Cuyabeno Lodge, are widely known for the knowledge about birds as well as other Amazon Jungle Animals and Amazon Rain forest Plants. The maps below show you the climate types and annual average rainfall of Ecuador. It is interesting to see that in the tropics very few Latin Americans distinguish between climate and weather and they use the two words for both meanings. (Just for our Latin American friends: climate means the generally prevailing weather conditions of a region, as temperature, air pressure, humidity, precipitation, sunshine, cloudiness, and winds, throughout the year, averaged over a series of years, while weather represents the atmospheric conditions at a specific moment at a specific place). Also, the seasons are interpreted differently. The dry season is called verano (summer) and the wet season invierno (winter); these indications are completely unrelated to summer and winter on either the northern or southern hemispheres. Seasons may be named accordingly, whenever a dry/wet period occurs. In fact, a very common expression is "hace verano/invierno" ("it's summer/winter") to indicate that the sun is shining or that it is raining. 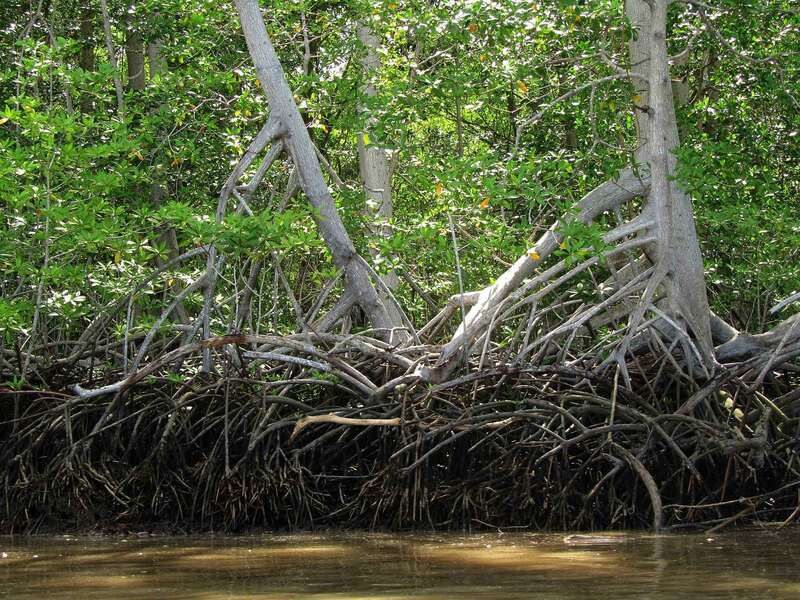 With so many different climate zones, there always is a best time to visit Ecuador.